In the eyes of a <em>FF VII</em> fanboy, every other <em>FF</em> is a disaster. Earlier this month, the gaming world was set ablaze with news of the return of Cloud and company in the upcoming PS4 remake for Final Fantasy VII, a game so beloved among PlayStation JRPG fans in the '90s. A month before the E3 announcement, another Final Fantasy reprisal came out: the Final Fantasy X/X-2 HD Remaster—a duo of FF titles that came out for the PS2 in 2001 and 2003 respectively. Sporting even smoother visuals than the PS3 and PS Vita remasters released back in December 2013, these enhanced versions provided PS2 gamers a chance to revisit the world of Spira and its inhabitants in glorious 1080p with better detail and visual depth. That, along with extra content such as new dungeons and a movie that ties the two titles together, has helped the game achieve a positive metascore of 83 on Metacritic. YET, not everyone is pleased with the definitive version of the classic RPG. Namely: FFVII fanboys. They are the gamers who swear that Final Fantasy hit its absolute peak with the seventh game, and went downhill from there. 1) "HEY TIDUS, YOUR SWORD IS LAME. WHY CAN'T YOUR SWORD BE AS COOL AS THE BUSTER SWORD?" 2) "YOU'RE CUTE YUNA. BUT TIFA'S STILL THE HOTTEST FF CHICK!" We say: Both have their strengths. Yuna can summon powerful monsters called "Aeons." Tifa can summon knockouts with her fists. We wouldn't mind taking either to a date, too. 3) "HEY TIDUS, WHY CAN'T YOU BE MORE EMO LIKE CLOUD OR EVEN SQUALL? YOU'RE TOO JOLLY FOR AN FF HERO." We say: Cloud isn't alone. In the PS2 generation, the brooding male lead was replaced by something generally jumpier and happier. Just ask Solid Snake in Metal Gear Solid 2. 4) "STOP STARING AT US KID; YOU'RE CREEPING US OUT." 5) "HEY TIDUS, STOP FEELING LIKE A BENCH MODEL." We say: Technically, Tidus might have what it takes to model for the clothing brand. 6) "LIMIT BREAKS > OVERDRIVE"
We say: Different names but they're kind of the same things, really. 7) "AND WHAT KIND OF ARCHENEMY IS SIN ANYWAY? SEPHIROTH'S MUCH MORE BADASS." 8) "WHY CAN'T THEY JUST CARRY OVER THE MATERIA SYSTEM FROM FF VII?" We say: FF X's Sphere Grid something is actually a fun way to build up your character. 9) "MORE LIKE ZANARKAND APES!" We say: We've resorted to name-calling, haven't we? 10) "HA HA! EVEN THE GAME IS TRYING TO GET RID OF TIDUS EARLY ON." We say: He's not lying. Adding the boss from entry #7, Tidus faces at least four bosses in the game's first hour and a half. 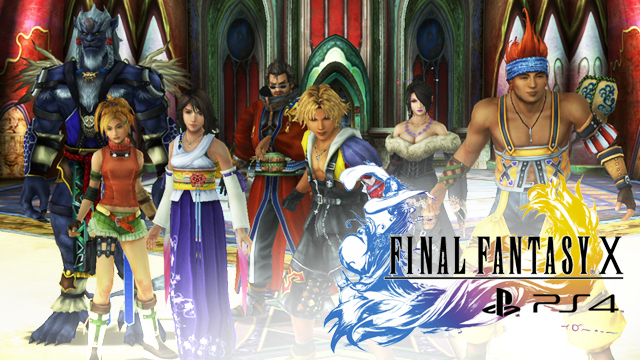 Final Fantasy X/X2 HD Remaster is out now for the PS4!